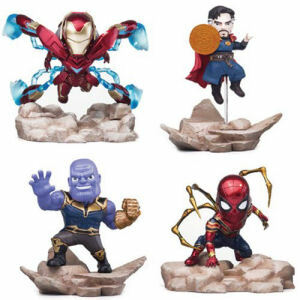 We have Just Sold out of Marvel Infinity War Mini Egg Attack MEA-003 Mini-Statue 4-Pack Set - Previews Exclusive. Not to Worry! Fill in the Notify me When Available and you will be the first in line for our restock of Marvel Infinity War Mini Egg Attack MEA-003 Mini-Statue 4-Pack Set - Previews Exclusive !! From the Avengers Infinity War collection by Beast Kingdom. Marvel Infinity War Mini Egg Attack MEA-003 Mini-Statue 4-Pack Set - Previews Exclusive. This 4-pack of Mini Egg Attack Mini Statues feature Iron Man - Dr. Strange - Thanos - Iron Spider.